The Bendigo goldfields were born out of the discovery of gold early in 1851 in Golden Square. There was a rapid growth in development and population from that year onwards. Church services were soon being organised for those of the new community who were members of the Church of England. It is thought that the first services were probably held in a room at the rear of the present United Kingdom Hotel in Golden Square. This would have been at least as early as 1858, and possibly as early as 1855. In 1860 the parochial district of Golden Square was established. In 1868 the site was purchased and a wooden building was erected serving as both church and Sunday school. The wooden building remained in use for the best part of a 100 years. In February 1881 tenders were called for a brick building with William Smith being the successful architect and the foundation stone was laid by Archdeacon MacCullagh. The building was opened and dedicated by Archdeacon MacCullagh, Rector of St. Paul’s in August 1881. In the 1907/08 financial year, at a cost of 65 pounds, 14 shillings, a new roof was fitted covering the existing slate roof and in 1938 a new brick vestry was added to the existing church. During its life, St. Mark’s has been part of many different Parishes in the Diocese. In 1868 a new Parish of St. Paul’s was established and St. Mark’s lay within the new parochial boundaries. 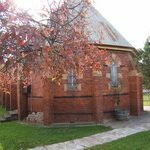 Other changes included St. Mark’s as part of the Combined Central Parish comprising All Saints (the then Cathedral) and St. Matthew’s, Long Gully. Later St. Mark’s and St. Matthew’s became the Parish of Bendigo West. 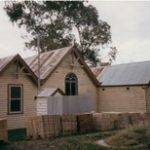 In recent times, St. Mark’s joined the Parish of Kangaroo Flat combining with St. Mary’s and then in 2005 became the single church Parish of Golden Square. A beautiful feature of St. Mark’s is the 17 stained glass windows in the church.The central stained glass window (Christ crucified) is dated 1882. Most of the other stained glass windows appear to have been dedicated/installed in the 1950′ – 60’s. The last two plain windows were replaced with stained glass in 1981 as part of our centenary. They are in memory of 100 years of worship and music. St. Mark’s is a plain rectangle but it has an interesting architectural feature – an apsidal sanctuary. This is quite an unusual focal point. The open-beam inverted “V” ceiling in stained timber is also a feature.